Music is a commodity under siege. The highest grossing product of the music business, by far, is the recorded song.1 Songs have been plummeting in value for more than fifteen years—well before 1999, the year that Shawn Fanning enabled free file sharing of recorded music with Napster, the homegrown software built for the internet and the compression algorithm MP3. As will be shown in this paper, real album prices in the U.S. have in fact dropped consistently since 1990. I would like to suggest that today there appears to be a palpable divorce between recorded music’s exchange value and its use value. Although this terminology is reminiscent of Karl Marx’s discussion of the commodity “labor-power” in the famous first chapter of Das Kapital, my frame of reference includes both a supply and a demand analysis of recorded music and not just a discussion of the production of music itself.4 Four international record labels, i.e. Universal, Sony-BMG, Time-Warner, and EMI, largely determine the entire supply of music. Demand is another matter. The buyer is increasingly treating music as water. It is a useful and necessary commodity, but plentiful and cheap. Alfred Marshall, and fellow economists today, might talk of an increasing total utility for recorded music but a decreasing marginal utility when compared to other goods.5 This is because at the equilibrium condition for the consumer it is posited that the marginal utility per dollar spent on recorded music would have to equal the marginal utility per dollar spent on, let us say, other goods. As the price of recorded music has indeed fallen against other goods, the inevitable implication is that the ratio of music’s marginal utility to other goods is adjusting downwards. In other words, recorded music’s relative marginal utility is falling and music is becoming less precious. The above argument about the diminishing marginal utility of music relative to other goods should be considered only for legally purchased music. A distinction has to be made, of course, between the marginal utility of legally bought music and the marginal utility of pirated music. Pirated music is acquired online over the internet or physically some place else. But it is the marginal utility of legally bought music that concerns the music trade. Pirated music, nevertheless, is the big elephant in the room. Consumer satisfaction is the basis of utility theory and the existence of free music, conveniently accessed from one’s desktop, impacts the utility function for recorded music that is purchased legally. In addition, the prevalence of piracy signals important objective information about substitute prices for recorded music. Though consumer theory maintains the independence of a consumer’s utility function from consumer incomes and prices, this surely detracts from satisfaction. The effect of internet music piracy on the market for legally purchased recorded music products can be addressed directly with supply and demand diagrams. A garden-variety analysis would indicate a leftward shift in the demand curve due to a drop in consumer preferences. The change in demand would be measured along a static supply curve, resulting in a lower equilibrium quantity and price for legitimate recorded music. Prices of recorded music product also dropped as expected. Nevertheless, prices were falling well before there was internet piracy, so the drop cannot be explained just on account of the advent of free music via a computer, starting with Napster in 1999. A price index for recorded music products in the U.S. is calculated below. It goes back to 1990 and shows that, in real terms, music prices had been dropping significantly and continuously well before internet piracy became rampant. This finding for the U.S. music market likely generalizes to many other countries inside and outside the OECD area, as will be argued later. Some observations about the price index follow. The index measures the evolution of nominal and real prices for a bundle of recorded music products. The bundle is made up of CDs, music video, LP/EPs, CD singles, cassette singles, and vinyl singles. Because DVD audio and digital downloads (almost all from Apple’s iTunes) did not exist in 1990, they are not included in the index. The researcher who follows the market will know that the consequence of this omission is negligible, for the significance of this product is still relatively small. Digital downloads accelerated last year7, but the index captures the historical trend in prices up to that moment. Table 1. Wholesale price index of recorded music products, 19902004. The index looks at the prices of CDs, cassettes, cassette singles, CD singles, music videos, vinyl singles, LPs, and EPs. It is a chained index that uses two base years for the expenditure weights, first 1990 and then 1998. It therefore recognizes the drop in cassette purchases towards the end of the decade. Music DVD product and SACD are excluded since 1998 to facilitate comparison with earlier years. Digital singles/albums accounted for only a small fraction of the business starting in 2003, and though they picked up in 2004 they are safely ignored, as are music DVDs and SACDs. ures to an average unit basis. The index, with some additional explanation, is shown in Table 1. It is important to realize that the above figures are likely to underestimate the drop in prices. This is because the labels were known to give discounts to retailers throughout the 1990s below minimum suggested retail price. The distribution of those discounts is unknown, but the impact on the data would have been considerable and the fall in the overall value of music even more precipitous. If real prices of recorded music have been falling in the most important music market since 1990, and much of this has little to do with internet music piracy, it is right to ask what factors other than piracy affected the value of music negatively. The 1990s, after all, were golden years for music sales. The conversion into CDs was in full swing in the U.S., OECD countries, and beyond. The economy, save for 1991-92, was doing well. Seen from this perspective, the drop in real recorded music prices in the 1990s is surprising. In 1993, Billboard published an op-ed piece by the president of EMI distribution in the U.S., Russ Bach, sounding the alert about declining real music prices in an ebullient market.8 The evidence suggests that record companies did not wish lower real prices to stimulate demand when it was strong anyway. To understand the riddle of music prices in the 1990s, when much more music was being bought than today, it is good to focus more in-depth on the supply-side of recorded music and the particular interaction that existed, and still exists, between the sellers of recorded music product, i.e. the record labels, through their distributors, and the brick-and-mortar retailers. A price elasticity of demand argument suggests that megastar releases are subject to inelastic demand. This, after all, is the music the buying public loves and that drives the market. Yet in the 1990s sellers could not maximize revenue by raising prices of their top-selling records. Had they been able to do so, the overall price of music would not have dropped as it did. In economic terms, the curse of music may be that it is a mass consumption commodity with many suppliers that wish to carry the product and over which sellers have little control. This seems to go against the prevailing wisdom that labels were in complete control of distribution prior to the internet. The price dichotomy for the most and least wanted music seems to work against the best interest of the labels. Moreover, variable pricing for music does not change things much. Even when price monitoring leads in parts of Europe to the alteration of an initial selling price to better exploit existing demand, there are limits to what can be done in the market for hits.12 Perfect competition at retail still robs the labels of their thunder. The above reasoning is made independently of the so called “lossleading factor” in music sales. Since the mid 1990s, and practically all over the developed world, hypermarkets were prepared to take a loss on music to drive customers in to get them to buy other, more expensive goods. Examples are Wal-Mart and Best Buy in the U.S., Carrefour in France, Tesco and WHSmith in the U.K., and the Metro AG Group in Germany. Record labels, naturally, came under pressure from their retail accounts to reduce wholesale prices globally. Additionally, hypermarkets offered lower prices for goods across the board and the convenience of all-in-one shopping. Worldwide, consumers flocked to them, driving recorded music purchases away from record stores and putting them into the realm of mass merchants. As a result, the value of recorded music dropped further. Today, the labels are trying to get Apple to recognize that not every song is worth the same to the consumer. There was little they could do to change business practices before the internet era, and they certainly could not maximize revenue by selling their best-selling product at higher prices. But, as digital downloads are purchased from iTunes, which has become almost a single point of sale for online music, there is a possibility that the recording industry might at last be able to negotiate better prices for megastar releases and lower prices for catalog product. Jim Urie, U.S. President of Universal Distribution, who represents the world’s largest label group, is lobbying for this change with other record company executives.13 The principle of revenue maximization based on a price elasticity of demand analysis for music could at last come into its own in the digital domain. The price mechanism is usually regarded as sending strong signals to traders. In economic theory, sellers are expected to offer more product with rising prices, not falling prices. Yet in the 1990s, the opposite was the case in the music market. There was more product put out while overall prices for music dropped, and hit music, the main reason for record companies being in business, sold “cheap.” It is suggested that this is not the result of a lower equilibrium price for music because of mass production improvements in the manufacturing of CDs. Such an effect would drive the supply curve of recorded music to the right, and explain lower prices. But this is not what happened. Yet, in spite of all this, record labels continuously supplied more music at lower prices. It seems reasonable to speculate that for the seller of music, quantity supplied, while still based on the expectation of profit, appears to be more a function of total revenue than selling price. It could be argued, therefore, that the essential factor in the revenue equation of the record label is the amount of quantity sold. Indeed, the signing of an artist has always been based on the perception of strong demand and a label executive is judged, in the end, by whether or not he has identified winners in the music race. Indeed, the selling price of a record is, more often than not, an afterthought in the record business. It could even be said that, with few exceptions, the price mechanism is incidental, ineffectual, and peripheral to de-cision-making in the business. A label, as noted by Papadopoulos (2004), is a multi-product business.18 Out of the roster of artists it initially signs, only a handful will get full support in the marketplace. Which artist will draw support is decided, most of all, on a hit-or-miss basis. The music business has been using the “let’s-put-her-out-there-and-see-if-she sticks” approach, and relied on volume sold. The cost function of a record label has been analyzed by Papadopoulos (2004), with contributions from Alhadeff and Sosnick (2005), and further additions pertaining to issues of financial risk and return by Papadopoulos (2005). This paper has addressed some of the revenue concerns of record labels. To an extent, it is argued that the marketplace functions in a way that prevents full maximization of label receipts and profits. It could be argued that the business of music is high in startup investments, and that much of the actions of the record labels as sellers are determined by the desire to recoup the money spent when they signed talent. Under this view, the labels would likely sell product at any price to replenish their coffers. Thus, the particular modus operandi of the supply curve of recorded music can be traced back to the labels themselves. The implication, of course, is that the price mechanism is being distorted further on the supply side by the desperation of the record companies. Moreover, this paper suggests that the compelling incentive for sellers of recorded music is the expectation of a high volume of demand. Selling prices, usually relied upon in economic theory to divine the intentions of sellers, are not the trigger of supply. The price mechanism, therefore, is not as crucial to decision-making in the music business. Sellers, it appears, come to market in spite of adverse pricing, and this is not just a consequence of piracy and the internet. Two of the rights that songwriters are compensated for are the right of reproduction of a song and the right of its public performance (also known as the mechanical and performance rights). Publishers collect for songwriters on both counts and generally split the collections with them 50/50. Although the cash cow of the business has always been the sale of recorded music, there is a sizeable flow of money towards publishers and songwriters. In fact, publishing revenues are, both domestically and internationally, growing considerably.22 The fortunes of the music publishing industry, moreover, are likely to continue improving with new ways to access music and better track plays. Appendix 1. U.S. recorded music industry scorecard, 1996-2004.Sources: RIAA, Annual Reports 1990-2005. The cost of living lndices used to estimate labels’ real dollar value were asfollows: 1990 = 100; 1995 = 114.8; 1996 = 118.2; 1997 = 120.2; 1998 = 122.2; 1999 = 125.6; 2000 = 129.5; 2001 = 134.0;2002 = 136.1; 2003 = 139.1; and 2004 = 144.1. The Economist, passim. Totals include digital singles and digital albums in 2004, as well as DVD audio and SAC. To see that particular data, go to www.riaa.com. Appendix 2. Wholesale prices of recorded music products, 1996-2004.Sources: RIAA figures 1996-2005. Average unit prices were calculated as the ratio of manufacturers’ dollar value toshipments. Real prices are the ratios of nominal prices to the CPI of the year in question. 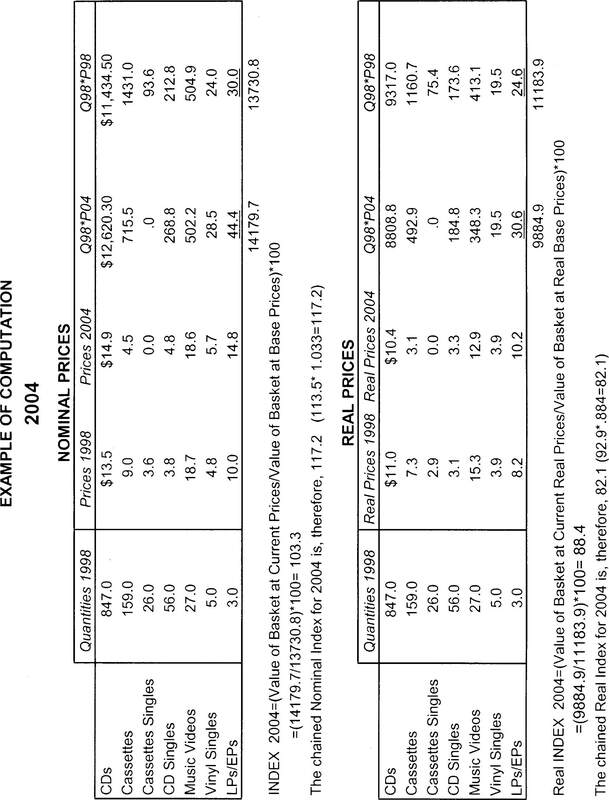 CPI’s were as follows: 1990 =100; 1995 = 114.8; 1996 = 118.2; 1997 = 120.2; 1998 = 122.2; 1999 = 125.5; 2000 = 129.5; 2001 = 134.0; 2002 = 136.1;2003 = 139.1; and 2004 = 144.1. The Economist, passim. Appendix 3. Wholesale price index of recorded music products, 2004. 1 The annual revenues of recorded music in the U.S. are about $12 billion, compared to $8 billion for music products (instruments, gear, and accessories), $3 billion for music publishing, and $2 billion for concert ticket sales. This rank ordering is typical in the global music business. 2 See the most recent Annual Reports of the RIAA and the IFPI (available at riaa.com and ifpi.org), the OECD report titled “Working Party on the Information Economy/Digital Broadband Content: Music,” (June 2005): 1–132 (available at oecd.org); Billboard, passim, and David Kusek and Gerd Leonhard, The Future of Music: Manifesto for the Digital Music Revolution (Hal Leonard, 2005). 3 Overall recorded music sales, physical and digital, continued to fall in 2005, and by three percent; see IFPI, “World Sales 2005: Digital Formats Continue to Drive the Global Music Market,” (March 31, 2005) (available at ifpi.org). 4 Karl Marx, Capital: Volume 1: A Critique of Political Economy (New York: Penguin Classics, 1990). 5 See, for example, J.R. Hicks, Value and Capital: An Inquiry into Some Fundamental Principles of Economic Theory (New York: Oxford University Press, 1976). 6 The latest year-end U.S. figures for 2005 came out while this paper was being finished and show another overall drop in the value of total sales, physical and digital, by 0.6 percent. The fall is smaller, however, than in previous years. RIAA, “2005 Year-End Statistics,” (March 31, 2005) (available at riaa.com). 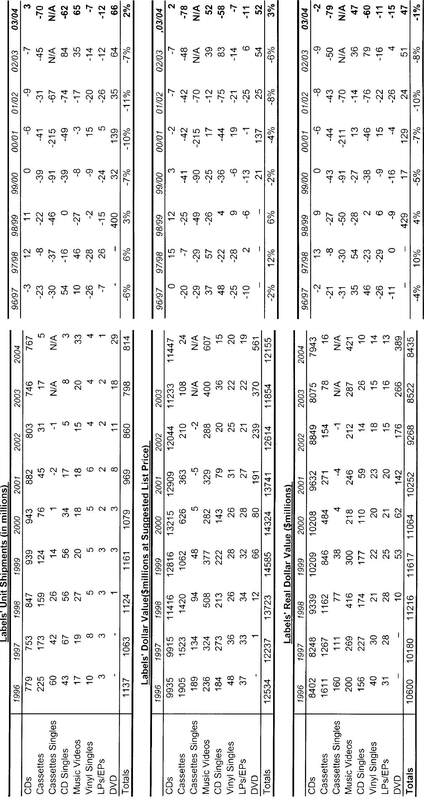 See Appendix 1 for the drop in album sales (CDs and Cassettes) between 1996 and 2004. 7 Nielsen SoundScan, “2005 Year-End Music Industry Report,” Press Release (January 4, 2005). 8 Russ Bach, “Let’s Take A Fresh Look At Retail Pricing,” Billboard (August 15, 1993): 4. 11 I am indebted to Mike Dreese, CEO of Newbury Comics, Boston’s independent and trend-setting retail chain, for first bringing this point to my attention. 12 In the U.K., where there appears to have been a greater menu of pricing options available to the consumer than in the U.S. (budget, mid-line and high-line releases), there should have been more accommodation to the pull of demand. Still, prices fell. See, for instance, “Supermarkets Successfully Take on Specialist Retailers” in Music Business International (October 2001): 19. 13 Urie’s remarks were made at the Berklee College of Music in Boston, when he spoke on the James Zafris, Jr. Distinguished Lecture Series for Music Business/Management on February 24, 2006. 14 Theo Papadopoulos, “Are Music Recording Contracts Equitable? An Economic Analysis of the Practice of Recoupment,” MEIEA Journal 4, no. 1 (2004): 83–103. 15 Peter Alhadeff and Barry Sosnick, “Record Labels, Artists, and Finance: A Contribution to the Economic Analysis of Cost and the Equity of Recoupment Practices in the Music Industry,” MEIEA Journal 5, no. 1 (2005): 13–17. 16 Theo Papadopoulos, “Financial Risk and Return in the Music Recording Industry,” MEIEA Journal 5, no. 1 (2005): 19–31. 17 An accurate cost-breakdown of a CD is given in Rolling Stone (Oct. 28, 2004): 26, 30. The article, by Warren Cohen, is titled “Wal-Mart Battles Labels Over CD Prices.” See also, OECD, op. cit. : 43. 18 Theo Papadopoulos, MEIEA Journal op.cit., (2004): 87. 19 Real time barcode tracking of music purchases has shown an immediate and complementary demand effect of new releases on old releases by the same artist, a point made by Trudy Lartz, VP of Sales at SoundScan, in various demonstrations for Berklee College students during the late 1990s. 20 For this, and other business fundamentals discussed below, see the classic Jeffrey Brabec and Todd Brabec, Music Money and Success: The Insider’s Guide to Making Money in the Music Business, 5th ed. (New York: Schirmer Trade Books, 2006). 21 The top five music publishers are ranked by Billboard from accumulated points for all their charted songs. They are, in order, EMI Music Publishing, Universal Music Publishing Group, Warner/ Chappell Music, BMG/Zomba Music Publishing, and Sony/ATV Music. See Billboard (March 25, 2006): 28–32. 22 Global music publishing revenues will grow at an annual rate of seven percent, to about $5 billion, by 2008. These figures far exceed the three and five percent growth in 2003 and 2004, already a far better performance than recorded music sales. Music & Copyright (November 9, 2005): 1, 12. 23 Keynote Address, Scott Sperling, Managing Director of Thomas H. Lee Partners, at Billboard’s 3rd Annual Music & Money Symposium, New York, March 4, 2004. © Business and Economics Society International (B&ESI). This paper was originally delivered at the society’s 2006 Annual Conference in Florence, Italy, July 15-19 and published in the Global Business & Economics Anthology (GBEA), a volume of selected papers from the event. Permission to reprint in the MEIEA Journal was granted by the 2006 B&ESI Conference Chair and Editor of the GBEA. The author wishes to acknowledge Theo Papadopoulos, Professor Michael Szenberg, B&ESI’s keynote speaker, and the stimulating remarks of conference attendees.